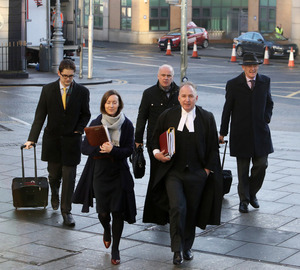 David Drumm and his legal phalanx team arrive ahead of jury selection for his trial on various charges relating to his time as Anglo Irish Bank chief executive. These include giving the markets the impression that Anglo’s deposits were €7.2bn greater than they actually were. 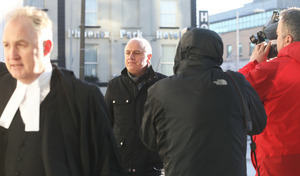 Mr Drumm, 51, from Skerries in Co Dublin, has pleaded not guilty. The trial is “expected to hear from almost 100 witnesses and could last up to five months”. Posted in Misc and tagged Anglo Irish Bank, David Drumm at 1:00 pm on January 10, 2018 by Bodger. Who is yer man in the hat? I immediately take a dislike to people who wear hats like that. I know it’s wrong, but there you go. Does he think he’s in America? I supposed the IFSC was once described as the wild west. Appropriate then. I immediately dislike barristers who insist on wearing gowns. The Court of King George is that way sir, this is a court in a republic! They have to. Not in family law cases, but it’s in the Superior Court Rules. Wigs, on the other hand, are a choice. By tradition, wearing them outside of a court building for any length of time guaranteed a bollocking from a senior colleague. After a six week “trial” the judge will direct the jury to find him “not guilty”. the guy in the hat is solicitor Michael Staines. the barrister at the front is Brendan Grehan sc. I look forward to the truth being laid bare, justice being done and the legal team turning into ostriches and being let out into Phoenix Park to graze on rainbows and peppermint-flavoured gazelles. 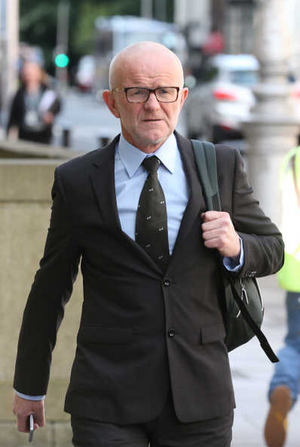 A pillar of society – not possible that he could be guilty of any impropriety, however should anything go wrong & things are not looking good for him, no doubt the trial will collapse on some unforeseen legal technicality. It’s the of the world folks. Another dragged out “trial” that’ll cost the taxpayers more millions, earn the solicitors more millions and will have no end result as Drumm will get off scott free or get a small wrist slap for sinking the economy. And that’s how I got out of jury duty this morning. not so much a trial as a gravy boat. I would think that crew don’t come cheap. What date is the acquittal? As Frank at NAMA is fond of saying “cui bono”-he never sold any shares,quite the contrary he took out a personal loan that bankrupted him to buy more shares ! Fascinating to finally find out what role the central bank,dept and min off finance played in all this…. It all depends on if the golden circle will let him off like they did his former boss or feed him to the wolves. 2007 – A luncheon sponsored by the Credit Reference Company Experian in either the Burlington or Jurys BallsBridge. UK ambassador was honoured guest. Seán Fitzpatrick stood up and made a speech demanding Less regulation in the Irish Financial services sector. 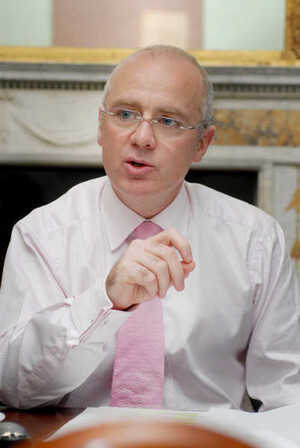 I remember some man, sitting at one of the tables, nosily scoffing in disbelief at every point Fitzpatrick was making, he had a few beers on him, and the whole thing was during the day, but I now wish I asked him what he knew..
David Drumm is a very nice man who deserves a fair trial and we should not judge him or slander him until the completion of his case and the proctologists report. Pity there’s not the same outrage amongst the Angry Left about thugs getting insultingly light sentences for robbing and assaulting people. Lads on 200 convictions terrorising the elderly in rural areas. And tonight’s whiner winner for whataboutery is Peter! By the way Peter, I’m not sure who you include in the lumpen term “Angry Left”, but I am aware that local media tends to give more coverage to the already elected TDs condemning the easily condemnable. Angry Left = politicians, councillors, academics, Rabble, neckbeards, SJWs etc.